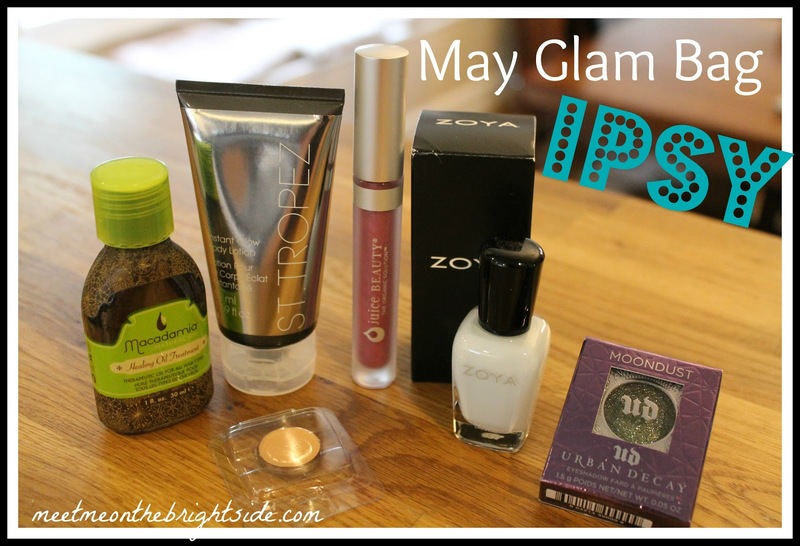 Meet Me on the Bright Side: Ipsy's May Glam Bag- "Spring Fling"
Ipsy's May Glam Bag- "Spring Fling"
It's not getting old, I still look forward to getting my Ipsy Glam Bag every month! Personally, I'd say this is my favorite bag yet! It's the first time the Glam Bag's have been customized with different products for different people. They're finally utilizing the information from your profile, Beauty Quiz, and your activity on the site, calling it ipsyMatch to give you products you'll love. There was a total of 15 possible products in which you could get any combination of 4-5 total in your bag. My bag was perfect, there's nothing I wish I had gotten that I didn't. I even got a bonus product from Urban Decay that I completely LOVE!!! Amazing! 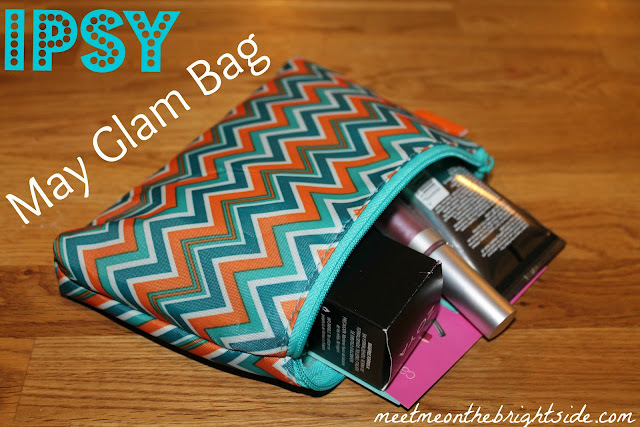 Love the Springy soft blue polish, and this alone pays for the bag this month! It's nothing life changing but I will use it. Smells divine and is a pretty pink gloss. Smells even better like a tropical Hawaiian beach vacation, Im obsessed! St. Tropez is my ultimate go-to self tanning brand, the best! it still definitely gives a natural looking golden glow. I'll definitely be using this plenty this summer! Beautiful!! It retails at $20, so it more than pays for this month's bag! So happy!!! color with glimmers of green, silver, blue, and brown. Possibly more. It's truly gorgeous and I think I'll do a separate post just for this! I loved my bag as well. I wish I had received the Blu polish, but I got a yellow sparkly one which is fine. Jealous of the UD eyeshadow! Haha. I always love getting my bags in the mail. I'm really wishing to sign up with them! WOW!! 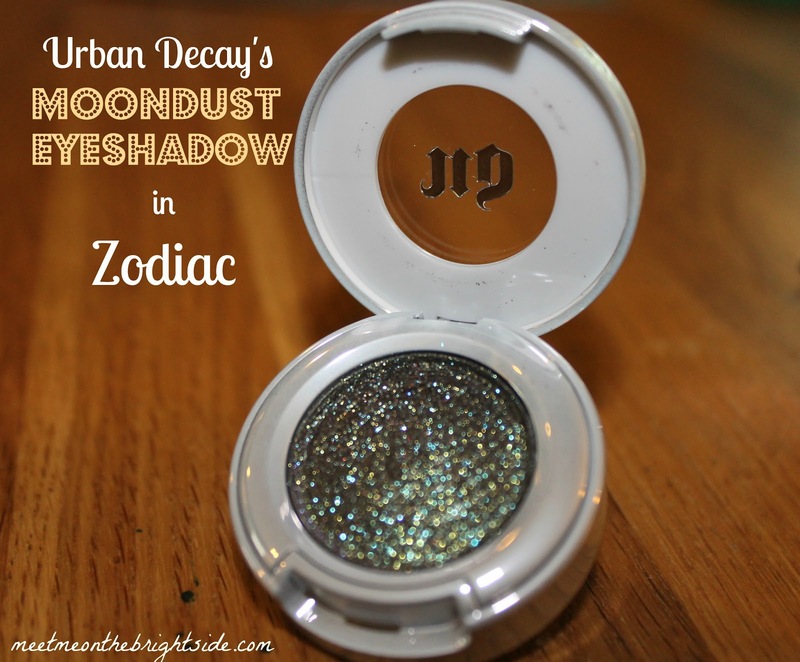 Love the UD moon dust!! Wish we could get Ipsy Glam bag in australia! We got mostly the same bag, except for the Macadamia oil (I got the Mirabella lipstick). I'm really pleased with this month's bag, it makes up for the last two, which kinda sucked in my opinion. Wow you got great stuff! I also love that chevron bag it came iN! That moon dust looks so pretty! I love Urban Decay as well.